Home Archive by category "Richmond"
Visiting assisted living facilities or memory care facilities is a must as you determine where your loved one feels comfortable and offers what s/he wants and needs. Even if the first one you visit feels like “The One,” having other facilities to weigh it against is extremely important. Plus, we guarantee your experiences at each community will teach you something, or shed light on an unfamiliar idea you didn’t know before. This well-rounded base of information will be fruitful as your loved one begins the transition into their new community. Should We Visit Several Facilities? Ideally, you would visit around three different communities before making a final decision. Touring about three allows you to make some important comparisons between different facilities so you and your loved ones can compare and contrast them and should give you a good idea of what you are looking for. Many people assume touring as many as possible is the best option, but trying to tour four, five, six or more is virtually impossible for most people, and can make the experience overwhelming. Even the best note taker finds it difficult to recall things from four or five visits ago especially if you are trying to visit as many as you can in one day. If you really want to tour a large number, we recommend you schedule them on different days and give yourself time in between tours so you aren’t rushing from one tour to the next. Leaving a few hours, or even a day, between tours provides the time needed for you to think about the tour, what you liked or didn’t like, and even get in touch with the director to ask follow up questions. This information will also help you as you move to tour the next facility. However, do note that there is a difference between assisted living facilities and memory care centers. While the former may have a memory care wing or department, the latter is entirely focused on dementia and Alzheimer’s care. If you’re deciding between the two options, you may need to visit a few in each category since you’re making two separate decisions: 1) which type of care is the best one for my loved one, assisted living or memory care, and 2) when that decision is made, which assisted living/memory care facility do we like the best. The better prepared you are before scheduling visits and tours, the better able you’ll be to take it all in with a discerning and expert eye. You’ll know what questions to ask, which areas you want to observe or check into, which activities you’d like to watch or participate in and so on. Otherwise, it can go by so fast and you may become so overwhelmed that it all seems like a blur. If the following recommendations are put into play ahead of time, you’ll find your visits feel more calm, intentional, and productive. This may be a bittersweet reminder of what it was like to search for a home, and that’s because it is just like that. The facility or community you choose will become home, neighborhood, community, and more for the resident who moves in. For that reason, a list of “must-haves” and “wants” becomes helpful as it gives you a solid foundation to start as you determine where to tour. A quick list of general questions is also helpful if you’re narrowing the field between multiple options. Your list and questions also ensure you’re comparing apples-to-apples when you sit down to discuss your observations, feelings, and findings with your spouse, family, and friends. Establishing this list at the outset also saves time and energy. A quick conversation and run-down of the list with facility staff ahead of time may automatically rule some prospective assisted living or memory care facilities out before you tour them, allowing others to rise to the top. Many of these items can be determined by visiting websites and reading promotional or marketing materials that can be downloaded or mailed to your home. Detailed reviews ahead of time save you from touring or visiting a place you wouldn’t have if you’d had more information beforehand. Ask ahead and verify if the entirety of your tour (or at the very least, the Q&A session) can be recorded by you. Hopefully, the answer is, “yes,” and this gives you the opportunity to relax that busy brain so you can soak it all up. You’ll leave knowing it can all be played back at home to catch anything you missed or review their answers to your questions. Practice recording ahead of time, and check the recording frequently during the tour to make sure it started and that it isn’t accidentally turned off before you’re finished. Since it’s easy to go off on tangents and asides, we recommend printing a separate copy of your list of questions for each tour you attend so you can check each question/answer off as you go. Take notes if you like, but your voice recording will be there for you to fall back on when you return home. The goal is to make sure each question is answered in full so you feel clear about your final decision. Most importantly, as you visit your three to six prospective assisted living or memory care centers, trust your instincts. Sometimes, the place that looks the best on paper or that sounds the best via radio commercials or personal referrals doesn’t feel the best to you and the future resident. Honor these feelings. It means it’s not the right fit for you, and by crossing that prospect off your list you are one step closer to finding the right memory care center to call Home. While all the preparation in the world can give you a great deal of insight, going with your senses and intuition during tours it critical, and just as valuable as the best, most clear-cut answers you receive to your questions. And, always keep in mind that the most important factor in this decision is which facility makes you and your loved one feel the safest, most comfortable, and secure. Transitioning a senior loved one into memory care requires a delicate choreography and balance as you determine the “best way” to move into the new place, decide what should go and what should remain behind, and even how often you should wait – or not – before visiting. In most cases, your loved one’s level of comfort or agitation will determine how soon or how often you should visit. Also, trained memory center staff have wonderful insight into whether your presence seems to soothe or unsettle their new resident, or what times of day seem best for him/her (which may vary in the new setting from what you were used to at home). Feel free to check in with the staff to learn more about how your visits affect your spouse, parent or relative. Often, visits from you and other loving, familiar faces help to ease the transition from home or an assisted living facility into a memory care community. In the beginning, these visits may need to be more regular to help the new resident settle in. Regular visits from the ones they love assure new residents they are not being forgotten or abandoned. Your presence proves you meant it when you said, “we’ll visit you often,” and that can provide peace of mind. There are exceptions, however, to the above. Some new residents have a harder time settling into their new home and need more time before they are ready for a visit. When well-meaning visits immediately after a move cause more homesickness instead of less; or more agitation than calm, or emotional goodbyes, ask the staff if you should consider waiting before your next visit. This can lead to emotional and traumatic goodbyes. If it seems early visits are detrimental to the resident’s ability to settle in, administration or staff will recommend a modified visiting schedule. It may be that remaining absent for a full week or two is enough for your loved one to “re-anchor,” after which regular visits are better appreciated. NOTE: It can be heartbreaking if your loved one falls into the category of “less is more” on post-transition visits. Let’s be honest, while regular visits from loved ones can help your loved one with the change, those visits are just as likely to help you transition into a new life. If it turns out you need to take a visiting break in order to facilitate the new resident’s transition, consider this your opportunity to adjust to your new life as yourself,rather than a full-time caregiver. Often, residents settle in so well, and become so instantly engaged in the routine of routine, calendared social events, we realize that it wasn’t your visit that triggered the agitation, it was the fact that it coincided with a favorite music class or crafting activity they enjoy during that period. Establishing the best days and times for visits, with respect to your loved one’s “optimal time of day” or the center’s activity calendar, could be the key to more satisfying visits. Depending on how your loved one’s dementia progresses, visits may increasingly become a challenge. The temptation to come in “reunion format,” especially when family is visiting from out-of-town is a natural one. However, this may be too overwhelming for someone with dementia. Instead, plan for only one or two people to visit at a time, perhaps staggering visits over the course of the collective group’s visit. This keeps things simple and focused. Hopefully, you put together or brought along some great photo albums to provide a comforting sense of “Home” in the new living space. Photo albums are a great way to spend quality time, reflecting on the past and hearing family stories you may not have heard before. Our culture is a busy – and talkative – one. We don’t always thrive in silence, hence the term awkward silence. However, as memories fade and those with dementia have a harder time finding the right words (aphasia), conversations get shorter and shorter – or more challenging to follow. Use this opportunity to enjoy the sanctity of quiet and the simple, physical presence of someone you love. If the weather is nice, take a walk together or sit with a beautiful view and see if things like birds, trees or beautiful flowers elicit a notice or verbal acknowledgment. If not, the silence can become a welcome respite from the outside world. Questions like, “Do you know who I am?” or trying to reinstate who you are can be very upsetting for those with dementia. Be prepared for visits when they know you, and those when they don’t, for stories remembered and stories forgotten. Finding ways to connect positively where they are each day will lead to higher quality visits with your loved one. There is no doubt that anger, frustration, resentment, etc. can be tangible at the unconscious level. Try your best to remain as positive (or neutral) as possible during visits to prevent agitating your loved one. That being said, it’s also okay to cut a visit short if you need a break, and it’s also encouraged that you honor and be present with your loved one’s feelings when s/he expresses sadness, grief, frustration, etc. A transition into memory care is a big one for everyone involved, not just the new resident. Be gentle and patient with yourself – and your loved ones – as you work to find the visiting routine that’s “just right” for the well-being of all involved. For some seniors, transitioning into assisted living or a memory care center is relatively smooth and even a welcome one as they enjoy the renewed ability to engage with the world around them. Other times, the transition is very painful and much more challenging. As a family member – particularly a primary caregiver – watching a loved one struggle emotionally as they resist their new change, beg to be taken home, or react dramatically when you leave is absolutely devastating. Often this can mean going through the emotional trauma of a crying or wailing loved one as you pry yourself away to return home after a visit, or perhaps you are the one crying and feeling guilty about leaving. In worst case scenarios, this can result in family members avoiding visits altogether as they struggle to say goodbye is simply too hard. Here are some tips and considerations to help you cope with the emotional struggle involved when your loved one cries, becomes angry or seems despondent when you say goodbye. How long has it been since your loved one moved in? Everyone adjusts differently to their transition into assisted living or memory care. For some, having lots of visits on a regular basis is very helpful. For others, constant visits make it harder for them to accept their new living situation and to willingly forge new relationships and routines in their community. If the transition took place within the past few months, speak to the staff and see what they think. You may find that scaling back visits and leaving more time in between is the answer. While difficult for you initially, allowing your loved one more time to completely settle in and find their place could make future visits and goodbyes more successful. Read, How to Move a Parent with Dementia into Assisted Living. Even if you’ve already made the move – the information you find there can offer insight and recommendations you can put into place. Those with dementia can be highly attuned to the stress levels and emotions of those around them. In some cases, verbal communication tools may no longer be available, and you may find someone with dementia more likely vent their emotions in other ways or become agitated very quickly. Next time you visit your loved one, pay close attention to your own emotional field. Are you angry? Do you feel sad? Are you feeling guilty? Are you anxious as you anticipate the potentially dramatic goodbye scene? Learning to manage your inner, emotional landscape can be very helpful in minimizing your loved one’s emotional response. A professional therapist and/or a support group, as well as the assisted living facility staff, can help you here. By remaining calm yourself, and learning the best and most comfortable way to hug and say goodbye to your loved one, may greatly reduce or even eliminate their strong response. It is not uncommon for those having a dramatic goodbye reaction to then quickly snap back to “center,” going normally about their day once their spouses or family members leave. Again, remaining in communication with administration and staff is crucial in determining how much of a problem their tearful or emotional goodbye really is. If it turns out your loved one continues his/her reactive response (crying and remaining agitated, etc.) for a long time after you leave, that’s one thing. If it turns out that you feel sadness and guilt for far longer than your loved one is sad – it may be time to re-frame the farewell story for yourself. Work on learning how to be present with their very real sadness at your parting, but with the confidence and peace of mind that in a short while, they’ll be back to normal again. As we touch on below, you’ll feel a lot less guilty if you find out your loved one wipes his/her tears once you drive away and heads happily over to the community room for the piano player or singing hour. At the Memory Care Center, we work closely with families to facilitate the transition into our center – and that includes recommendations on what to bring to their room and living space feels as personal and cozy as possible. Take another look around their room and ask them about what items they might like to see added or swapped out. Having familiar textures, pictures, memory-keepers, scents, etc., in their room can work wonders for anchoring them between visits. A simple conversation may enlighten you about things s/he wished had been brought, things s/he wishes were there, etc., and hopefully, you can find a way to accommodate their needs. Often, that tearful, fretful or even dramatic goodbye scene has more to do with your loved one’s daily rhythm than it does about your departure. Check in with the staff to learn more about your loved one’s “best times of day” versus the times of day they struggle the most. Are there days of the week that are better than others? Insight into those questions may help you find a better day of the week or better time of day, and that simple calendar shift could make a notable difference. Another important question to ask if you haven’t done so already: what activities are your loved one’s favorite(s)? Joining a support group can be instrumental in helping you facilitate the spectrum of emotions that arise when you have a spouse, parent or loved one in memory care. These support groups meet during a range of days and times, so hopefully, you can find a local support group in your area that works for your schedule. No, the group can’t make the grief, sadness, and anguish go away altogether, but there is great comfort in knowing that you are not alone. Plus, sitting with a group of people who have been where you are means you have access to all kinds of “professional” tips, recommendations and ideas that may help you figure out the best way for bidding farewell to your loved one without absorbing the impact of their intense reaction. It may take more time than is comfortable for you, but by considering the above ideas, you’ll find a way to navigate tearful goodbyes with less emotional angst. Moving a parent or senior loved one with dementia into an assisted living or memory care community is a major transition. It’s an emotional journey and there are bound to be upsets and logistical challenges along the way. Having a go-to list of tips and suggestions can help you and your family better prepare to move a parent with dementia to assisted living while ensuring s/he receives impeccable care. If possible, begin making the long-term care plan as early as possible after the dementia diagnosis. If your parent or loved one is in the beginning stages of Alzheimer’s or dementia, looking ahead to find the right community allows them to be a part of the process, which can make for a smoother transition when moving day arrives. Ideally, the time to move to a community is when s/he is no longer able to live safely and independently at home or when the level of care required becomes more than what you and/or other caregivers are able to provide from a time and safety perspective. On the flip side, if your loved one is in mid-to later-stages of the disease, it can be upsetting to engage him/her in selecting a community and planning moving day. In some cases, it is better to wait until the change is eminent to announce the move, and enlist the help of family and friends for decision-making, sorting, and packing. Visit our Guide for Talking to a Loved One About Memory Care for more insight into this topic. Not all assisted living communities are created equal, and many of them aren’t equipped to adequately care for residents with Alzheimer’s or dementia. Moving is challenging enough, and the last thing you want to do is have to move your parent a second time unless you absolutely must, so it is important to select the right community specializing in memory care. Use these Questions to Ask When Visiting Memory Care Communities to help you select the best new home for your loved one. Familiarity is key to feeling safe. Once a community is selected, some people find visiting the community a few times before moving day helps ease the transition. You and your loved one may consider attending and participating in activities and events, meeting other residents with similar interests and interacting with staff. Each of these visits proactively builds layers of familiarity. Typically, late mornings and early afternoons are a dementia patient’s “best time of the day.” Early mornings and evenings may be more difficult. The transition from one home to the next will be less stressful when your parent is most likely to be calm, allowing more time to settle in before s/he becomes fatigued or agitated. Odds are their new room is smaller than their current home, and clutter is a recipe for confusion and trip hazards. If you haven’t received information from the assisted living community director or staff about what to bring from home, give them a call to find out how much is “just enough” to bring. In some communities, rooms come furnished, but you should still be able to bring touches from home such as a favorite chair, wall art, personalized bedding, a CD player or iPod/docking station to play his/her favorite music. At The Memory Center, our rooms are unfurnished to allow residents and their families to more closely recreate a space that looks and feels like home. Having familiar pieces from home helps new residents settle in more quickly. And again, be careful about asking your parent “which item(s) do you want to take with you…,” as these types of decisions can be agitating in later stages of the disease. We recommend reading Making A New Space In Assisted Living Or Memory Care Feel Like Home for more information on this important topic. This is a major physical transition, to be sure, but it’s also a major emotional transition for everyone involved. Often, spouses and family members are the most dramatically affected as they watch their loved one settle seamlessly into place while the rest of the family is experiencing a sense of grief. 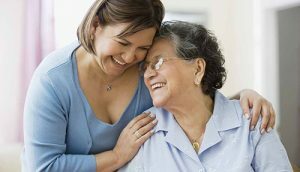 If your parent opts to move into assisted living in the earlier stages of dementia, you may find support from a counselor valuable who can help you or your family process the complex array of emotions the transition elicits. If you’ve been an integral part of your parent’s dementia care, we suggest reading, Adjusting to Life…After Being a Caregiver, which offers nourishing tips on how to handle your next steps. First and foremost, the staff want to get to know new residents. The more they know about your parent, the easier it is to spark conversations and connect with him/her as s/he settles in. Additionally, it’s helpful to lean on the staff and allow them to explain the new transition and to support your parent during the move. Again, choosing a memory care-specific community means the administration and staff are well-versed experts and will know exactly what to say without causing further confusion or upset for your parent. As with all life transitions, mindful and methodical preparation is the key to minimizing mental and emotional stress. Selecting an assisted living center that specializes in memory care will provide the support you need throughout the move. At The Memory Center (TMC), we’ve developed a Town Center experience for the overarching design, using iconic stimuli from the past and including amenities such as a movie theater, pub, hair salon, general store, and more. Our common spaces are filled with natural light and style and our landscapes are beautifully designed. We also recognize residents and their families want spaces to feel like home and familiar. This is especially true in resident bedrooms. That’s why we heartily encourage residents and their families to think of our beautiful space as a backdrop to create the bedroom space representing what home feels like to you. If you have visited loved ones in senior living facilities, or even toured some, you may have noticed sleeping areas resembling a hospital or rehab setting vs. an inviting and comfortable space. 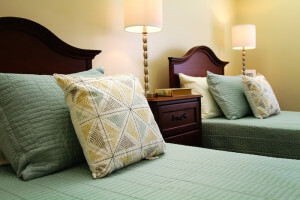 When it comes to individual rooms at TMC, we intentionally create light filled spaces with neutral color palettes, and without standard furnishings. 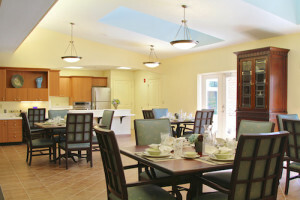 This way, each resident has the opportunity to add his/her personal furnishings and touches from home. We encourage families to bring familiar artwork, furniture and bedding that express individual style and a lifetime of memories. Below are some of tips to make a new room in a senior community feel like home. To help your family member settle into the new space and re-create their comfortable bedroom from home, bring pieces that are familiar and reflect their design style – such as their favorite chair, side table and small dresser. Just make sure to leave family heirlooms at home. When deciding what to bring, look around your loved one’s current bedroom and take notes. Is there a nightstand on the right or left hand side of the bed and what do they keep on the nightstand? Which side of the bed are they used to getting out of in the morning? Do they keep a robe and slippers on a hook nearby? With planning you can provide the small touches of home they are used to. If bringing existing furniture isn’t possible, we can provide suggestions on where other families found home-like furnishings that work well in the space and we can provide guidance on how to prepare a comfortable room. We will even help with furniture placement. Decorative bedding, throw pillows and blankets help meet your loved one’s preferred comfort needs but also provide a simple way to add color, pattern, and personal style to the new living space. Do keep in mind we don’t encourage you to bring expensive or cherished items. Family heirloom quilts or expensive bedding is best preserved by other family members to keep them safe and sound. Think about which pieces of art are favorites for your loved one? Bedrooms at The Memory Center have enough wall space to accommodate a few favorite pieces of art or bulletin board of family photos and notes. Looking up to see a favorite work of art or framed photos of the family and pets creates an immediate sense of familiarity and can be essential for new residents as they settle in and begin creating a community of their own. While rooms at The Memory Center are spacious, there simply isn’t enough room for every favorite photograph to be on display. Thus, we encourage families to assemble photo albums, curating photographs through the ages. A small, portable album – with an easy-to-clean cover – will be well-appreciated as our residents often enjoy carrying albums around to share stories and “introduce” family to their new acquaintances and friends. Was your loved one an avid gardener? Did s/he grow fresh herbs or look forward to a fresh flower arrangement on the dining room table or buffet? Consider an easy potted plant and/or a vase that’s ready to accommodate flowers. If fresh flowers are important, consider a seasonal bouquet subscription which can be delivered regularly. Our staff will ensure plants are watered as needed and we can switch out fresh flowers when they arrive. TMC’s extensive and beautifully landscaped grounds will also provide a connection to Mother Nature and growing things. Our residents love to spend time in our sunny patio and garden. If your loved one is an avid gardener, we’ll make sure s/he can help point out favorite flowers in the garden or along our secure walking trails so s/he continues an activity that is familiar and productive. Each room at The Memory Center has a frame next to the door ready to be customized by, and for, the resident. Fill this space with a background color or pattern (wallpaper works well) that suits the resident’s style. Then add things like a favorite photo of themselves and family and/or a pet, or a picture of him/her doing something s/he loves. In addition to personalizing the space, they’re helpful reminders for new residents so they can easily tell which room is theirs. Decorated frames also help new residents get to know neighbors, staff and passing guests, often providing a perfect segue to begin a conversation. The more personalized the framed board the more special the space will feel and the sooner your loved one will sense a connection to their new home. Did you know music is proven to reduce anxiety and helps those with dementia to recall more memories? Feel free to bring a pre-loaded iPod/docking station or a CD player and CDs. Nothing says, “I’m home…” as the ability to switch on a music player to hear your favorite songs. We’ll make sure we know which radio stations are their favorites as well so staff can turn the radio on/off occasionally when residents want to hear something different. The more personalized a room is decorated, the more at ease a new resident will feel. Have questions about what does work – or doesn’t work well – to personalize your new living space? All you have to do is ask. Our administrators and staff are always happy to answer questions and brainstorm ideas to help new residents settle in peacefully so they feel at home in their new space. What Is The Memory Center’s Town Center Concept? Choosing the right memory care community is essential to your loved one’s well-being, as well as the well-being of your family. You want to select a place that is as dedicated to your loved one’s mental and physical well-being, as much as to their emotional comfort and security. This is where The Memory Center excels. We also recommend reading, How to Compare Assisted Living Communities, which outlines features, benefits and care specific to memory care. The Memory Center is primarily established to support the physical health of our residents, emphasizing the most current and relevant science around Alzheimer’s and other dementia-related conditions. However, we also know 100% that our residents fare best when their environment is conducive to a life well-lived. As you know, transitions become increasingly difficult for those with Alzheimer’s and dementia. At the same time, those with dementia often have existing medical conditions or may develop other age-related conditions during their time here. As a result, we have an on-site medical director who is available on a daily basis to confer with our staff nurses (who are on-site 24-hours a day) to address any issues that arise. Our medical director is a fellowship-trained geriatrician who, in addition to being available to our nurses, also schedules assessments with each of our patients on a weekly basis. The medical director coordinates home health services for physical, occupational, speech, and psychiatric therapies as needed, ensuring our patients rarely need to leave the premises for routine appointments and specialist visits. Whether you choose one of our Memory Care Centers or not, we highly recommend narrowing your memory care choices to those with on-site medical staff to reduce the number of off-site appointments or lab work that can agitate residents and cause unnecessary stress. Routine and normalcy is a key component in mitigating the side effects of dementia-related conditions, and it is also shown to slow down their progression. This is why The Memory Center establishes normal, safe, and reliable daily rhythms. Our center is designed to be attractive and includes the comforts of home and community, all within an extremely safe and secure environment. Our center was built with complete respect for the primary environmental objectives recommended by The Alzheimer’s Association. We’ve gone above and beyond to include a town-center concept with safe and highly-secure outdoor areas, including courtyards and walking paths. Sure, there are multiple similarities in terms of how dementia and Alzheimer’s show up, and what that means for those who are diagnosed. That being said, we also recognize that each of our residents is a unique individual,so we provide tailored care for each and every one. Specialized meal plans. All of the foods and treats available via our cafeteria, meal plans and the town center’s cafes and pub are made with respect to a healthy diet. We can create meal plans specific to a resident’s existing medical restrictions and/or sensitivities. Individual health care plans. As mentioned above, our dedicated on-site medical director, nurses and care providers are well-versed on each of our resident’s specific care plans and needs. Social events and programming. Our diverse array of classes, entertainment, social offerings, and classes are so compelling that we often hear quips from residents’ family and friends that they are ready to move in. These events are key to honoring the individual and creating a healthy, stimulating, and social environment that engages residents on a daily basis. While we do respect a resident’s choice to spend a day to themselves once in a while, we also provide the opportunity to participate in every aspect of the day. This is done via routine check-ins, conversations, and walks with staff. Our activities and entertainment coordinators thoughtfully create the weekly and monthly itineraries in a way that allows every resident to participate in the activities they enjoy on a regular basis. Often, well-meaning assisted living facilities offer programs designed for those with dementia but then simplify them unnecessarily. This results in classes that are better suited for young children, rather than independent adults. At The Memory Care Centers, we do prioritize programs that are both beneficial for those with dementia and to complement our residents’ innate talents and interests, but they are not simplified. Teachers, instructors, and presenters put together engaging, stimulating, and even challenging curricula and only amend these if a resident needs it, or to accommodate an existing disability. This enables our residents to embrace their interests and enjoy their faculties to the absolute fullest. Humans are social creatures, so social bonds, daily interaction and human-to-human connections are key to a lively, active and engaged mind and body. To this effort, every aspect of the outdoor and interior designs are dedicated to triggering reminiscences, participation, and socialization. Our intentional respect to these six memory care differentiators make The Memory Center unique amongst the area’s memory care and assisted living facility options. Suspecting a loved one has Alzheimer’s is anxiety-inducing, but the official confirmation from a GP or neurologist is life changing. From that moment on, it’s important to have current, accurate and easy-to-access information about Alzheimer’s, what to expect and the best means of supporting the well-being of both the individual diagnosed, as well as his/her team of caregivers. While an adjustment period is understandable, we recommend taking action as quickly as you can in order to create a long-term care plan that resonates with current research and findings pertaining to Alzheimer’s care best practices. The sooner you do this, the more involved the patient can be with making decisions that will impact the rest of his/her life. There is a myriad of results when you search, “Alzheimer’s Care” or “Alzheimer’s Research,” but not all resources are created equal. The most accurate and relevant information available online is typically provided via national organizations and well-known non-profits (usually website addresses ending with .org, .gov or .edu). The more you learn about Alzheimer’s, the better your decision-making process. Also, you are your loved one’s greatest advocate. Well-meaning physicians, nurses, and caregivers do their best, but there’s a chance that something you’ve learned will be essential to improving your loved one’s care and overall outcomes. Here are some of our favorite, online resources about Alzheimer’s, memory care and the latest research/findings. The National Institute of Health (NIH) has several sub-entities under its umbrella; one of these is the National Institute on Aging (NIA). The NIA has an incredibly thorough webpage that covers all manner of age-related diseases and conditions, and their page dedicated to Alzheimer’s Disease and Related Dementias is a great place to begin learning more about Alzheimer’s and the current treatments at your own pace. Their website has easy-to-read (and share) pages on the basics of Alzheimer’s, as well as the various forms of Alzheimer’s and dementia. This is important because medications, treatments, and care can vary depending on the type of Alzheimer’s or dementia. 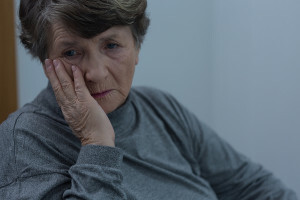 For example, while the symptoms of Lewy Body Dementia are similar to Alzheimer’s and other forms of dementia, the wrong medications can worsen the patient’s experience and symptoms if it is misdiagnosed and treated using more standard Alzheimer’s treatments. The Alzheimer’s Association was founded specifically to eliminate Alzheimer’s via high-quality research. 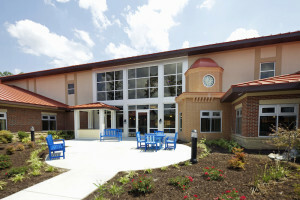 It’s a voluntary organization and, in addition to information about Alzheimer’s as well as the latest research and upcoming trials, the AA also works to connect those affected by Alzheimer’s in the Richmond, VA area with< a href=”https://www.thememorycenter.com/alzheimers-support-group-at-the-memory-center-richmond/”> the support they need. The AA is a joint venture, including the work of healthcare professionals, caregivers, and family members just like you. To date, the Alzheimer’s Associations has provided support for millions of people nationwide. One of the most effective resources offered by the Alzheimer’s Foundation of America is their Alzheimer’s Support Hotline (866-232-8484). This toll-free number is staffed 24/7, by licensed clinical social workers who specialize in Alzheimer’s and dementia-related conditions. Speaking with them can feel like a lifeline, especially for those who are newly navigating the vast array of information out there, or who have yet to confide in family members and friends. AFA is also non-profit and is dedicated to spreading the word that a proactive approach to Alzheimer’s has a significant effect on slowing down its progression and relieving or diminishing symptoms. They also provide FREE and confidential memory screenings in Richmond and nationwide. Often, those who are newly diagnosed with Alzheimer’s – as well as their spouses – decide to hide what they know for the time being. The problem with this is multi-fold; first, it’s confusing for family and friends who are noticing the same signs and symptoms as you did but without any explanation or further insight. Secondly, your family and friends are an invaluable resource as you begin to learn more about the disease and when it comes to providing certain aspects of care – as well as respite care. We recommend reading our Guide for Talking to a Loved One About Memory Care, as it covers important information about the communication and decision-making processes, as well as tips on how to include family and friends. As mentioned above, research shows that those with Alzheimer’s and dementia do notably better when provided with dedicated memory care. In most circumstances, those with Alzheimer’s have the best outlook and highest quality of life when they move to memory care communities sooner, rather than later. This enables individuals time to settle in, feel comfortable, and adjust to their new home while they still have the ability to make decisions for themselves. If you’re considering an assisted living facility, make sure they offer a separate wing or sections specializing in memory care so your loved one doesn’t wind up becoming part of their general residential population – the large majority of which have a different set of needs. Use, How to Compare Assisted Living Facilities, as a guide to better weigh each prospects’ offerings. Inevitably, the first level of care provided for those with Alzheimer’s takes place in the home via the loving attention of a spouse, family members and/or friends. However, caregiving is an all-consuming job, and the needs of the patient will quickly deplete the energy levels and well-being of the care providers if they don’t take care of themselves. Respite care is a must-have resource for anyone who is an immediate caregiver for a spouse or loved one with Alzheimer’s. This service is available via home care aides, adult daycare centers or memory care centers offering drop-in or short-term residential options. Make respite care a priority from the beginning so you can take care of yourself, observe routine appointments and enjoy well-deserved breaks and traditional family vacations. It used to be that assisted living or nursing home options were the only resources available when the level of care required moved beyond what was possible at home. Over the course of the past decade, however, research has shown that dedicated memory care centers – assisted living options wholly tailored to improving outcomes for those with Alzheimer’s and dementia – provide greater quality of life and improved outcomes for both patients and their families. Furthermore, we’ve learned that transitioning into memory care communities sooner, rather than later, is beneficial for all because it decreases the high-level of stress and the lack of autonomy for the patient that transpires when families wait until they are in crisis. By moving during the later-beginning or mid-stages of Alzheimer’s, the patient can settle in, learn their way around and create their own sense of community before the disease progresses. Most memory care centers offer in-house doctors and nurses, licensed staff, pharmacies and innovative resources that minimize the need for off-site appointments that become agitating for residents as their condition progresses. High-quality memory care centers adhere to Dementia Care Practices and provide ample “normal life” routines via amenities like the town center concept, which markedly improve the residents’ quality of life. Read, Questions to Ask When Visiting Memory Care Communities, to learn more about what you should be looking for when choosing the right memory care for your loved one. An Alzheimer’s diagnosis requires quick action to enable you the time to research and learn about the available care and support options for your loved one. You’ll soon find that such a progressive disease can be faced head-on, with dignity, given the right resources and support. Dementia is any condition that includes degeneration of the brain tissue. It can impair neurological functions such as reasoning, memory and communication. The symptoms of dementia also include emotional characteristics such as behavior, mood and personality. Each case of dementia is unique due to the brain’s complexity, especially its condition. Most people consider dementia to be the inflection of old age as it generally becomes more likely as we get older. However, a significant number of dementia patients are also younger. Young onset dementia (YOD) is any type of dementia that affects someone under 65 years of age. The significance of this age is primarily social, rather than biological because it’s the traditional age of retirement. Social changes during the past few decades have largely erased this distinction, making a designation of YOD generally irrelevant to treatment.